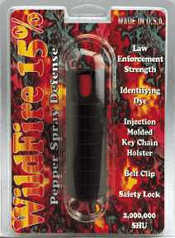 Wildfire 15% pepper spray is hot, hot, hot...15% pepper spray and 2 million scoville heat units. Wildfire comes in two sizes: 1/2 ounce and 1.5 ounce. Both units come with an injection molded poly holster, belt clip, keychain and safety switch.